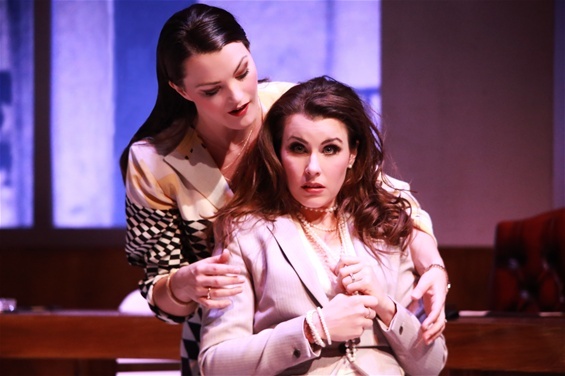 Maire Flavin (Agrippina), Anna Devin (Poppaea). Opera is extravagant, unrealistic and loud. Handel’s early creative life was devoted to opera. He wrote over forty in which he extended - without innovating - the dramma per musica conventions of the late 17th and early 18th centuries to which he was undisputed heir. Both during his time in Italy (where Agrippina was a clear-cut success) and in England where he spent nearly two-thirds of his life he was a composer in a hurry, writing for the voice in the established and repetitious formulae of opera seria but with music which exteriorised the mental states and the inner turmoil of two-dimensional characters who are transformed in our presence into credible, suffering fellow humans. Agrippina exemplifies this as convincingly as any of his subsequent operas. Irish Youth Opera’s production of Agrippina (O’Reilly Theatre Dublin, September 13) struggled to reach that plateau as its cast of young Irish singers explored the rarefied world of opera-in-performance through the theatrical interplay of several morally dubious but less than compelling characters. Indeed the entire ensemble of eight players (Handel always distributes the spoils even-handedly) took evident advantage of the opportunities offered by the music to shine in a production which chose to major on the comic features of the narrative at the expense of the vicious and the violent. Embracing this approach Anna Devin (Poppaea), Rachel Kelly (Nerone) and Alan Ewing (Claudio) skated the show close to pantomime – are there laughs in opera seria? – while the seriously serious elements of the Grimani libretto were gamely defended by Sharon Carty (Ottone) and Máire Flavin (Agrippina). But Flavin had to work upstream against those currents of farce and this diluted her attempts at dramatic flair in delivering one of opera’s most unscrupulously ruthless schemers. In all, this young ensemble (Ewing being elder guest and mentor) did respond positively and energetically to director Oliver Mears’ less than even take on things, yet the whole was not bigger than the sum of its parts. On the other hand the conduct of the 20-piece Irish Chamber Orchestra (Jonathan Cohen) sounded impeccable to me: isn’t there something immensely satisfying about the predictability of Handel’s music? One of the problems as we know with the welcome revival of interest in Handel’s operas since the 1940s has been how unperformed and outmoded these historical curiosities had become. Their dramatic language was quite foreign to 20th century ears as singers struggled with ornamental writing unknown in contemporary vocal ranges. So adjustments were made and the operas gradually became acceptable and largely so on their own terms. The revival is now steaming ahead in full historical performance mode, giving us a generation or two of new singers comfortable with the virtuosic shapes that Handel threw three hundred years ago. IYO’s Agrippina caught some of this on the wing: a production light on its feet - baroque music on speed, aria dominating recitativo – but Handel’s portrait gallery of damaged characters was not so skilfully sketched as to distract us from the opera’s original and innate repetitiveness. Yes, opera is extravagant, unrealistic and loud and it is sculpted in front of us by voices urging us to a willing suspension of our disbelief as they paint shared human passions with conviction and resonance. That, in my view, still remains to be seen, so how about a good cd set to listen to in the meantime? Do try John Eliot Gardiner’s 1990s’ reading for Philips, with Della Jones as an Agrippina you won’t easily forget.